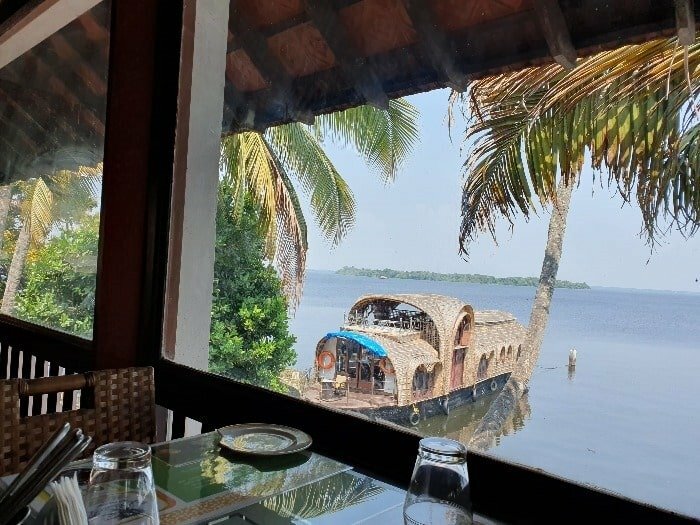 Last week I wrote about our experience at the enchanting backwaters of Kerala. The Lemon Tree Vembanad Lake Resort, Alappuzha was our shelter in between 20 hours of long drive to and from Bangalore. We paid for all our expenses and we have no incentive of writing this review. Well, we had a great time and want to share an honest hotel review with our readers. 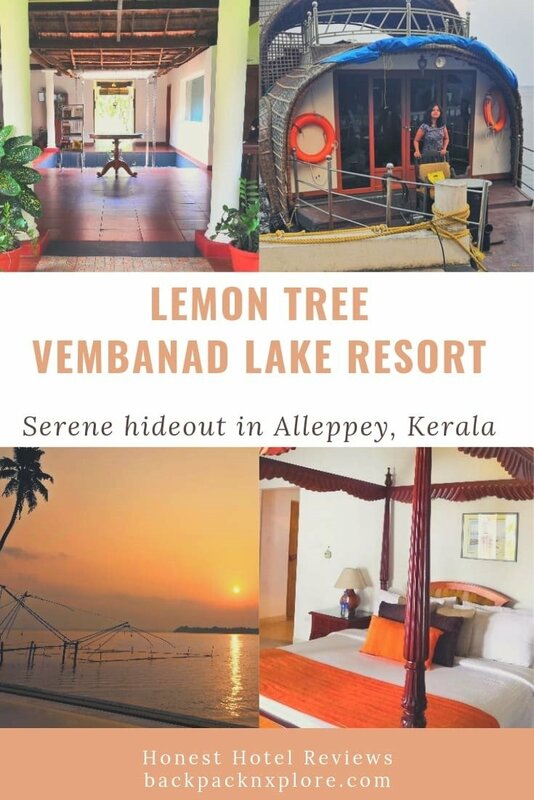 What to explore around the Lemon Tree Vembanad Lake Resort? After a smooth ride of almost 600 km, we finally made our way to Alleppey and reached our hotel by 12:30 pm. It was an unplanned trip after a whimsical booking. 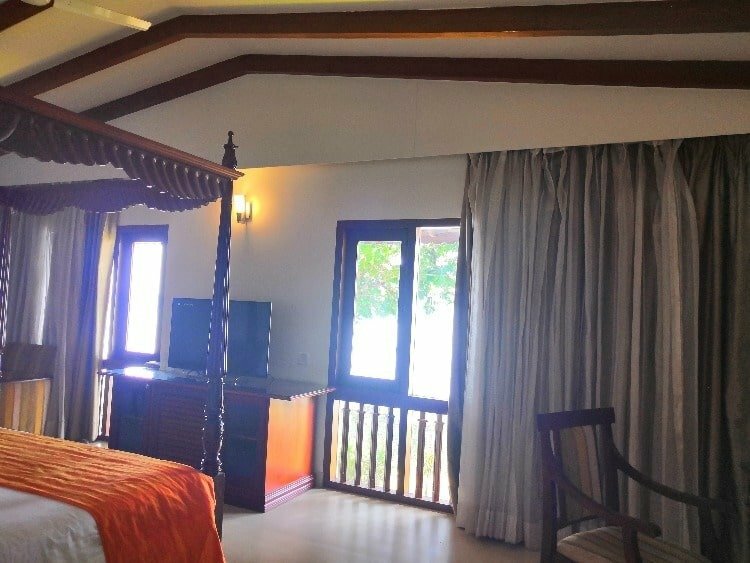 We found the resort at 50% of its usual price on MakeMyTrip and decided to book it. 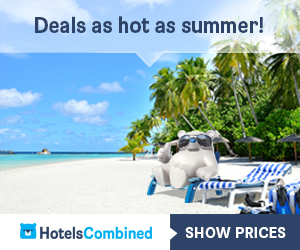 Compare the hotel prices on Hotels Combined, MakeMyTrip, Agoda and Cleartrip. My first impression was not great because the gates were closed and I had to get down at knock before it was opened. We were greeted with a welcome drink but it was taking the time to find a room for us. I understand the problem because these are the check-in is at 2 pm and check-out is at 12 noon. When we reached a few families were actually checking out at 12:30 pm. So it made complete sense for them not to be expecting guests at that point of time when we reached. We requested them to keep our bags until we just stroll around the resort. But the receptionists were kind enough to find us an upgraded room. Please note that we did not request for it, but we were upgraded to the superior lake-view suite based as the ones in the category we booked were not yet cleaned! Located right across the longest lake of India, the Vembanad Lake Resort is not a huge property. However, it is located away from the crowd, surrounded by forests and facing the lake. There are 27 rooms in the property of multiple categories. All the rooms air-conditioned, have electronic safe, free wifi and a basic tea/coffee maker set. The Cruising Villa – A fully airconditioned houseboat with two bedrooms, a living room and a jacuzzi on the open-air upper deck. The rooms would be typically small and the houseboat is anchored to the shore at night. Superior/ Superior Lake Front/ Superior pool deck – These rooms are beautifully decorated with cozy king-size beds, flat screen TV large wardrobed, shoe-rack, sofa, and center table. As the name suggests the superior lakefront and pool deck have better views. They are also a little bit larger with an approximate area of 364 sq ft.
Superior Lake Front Suite – This is the category that we were upgraded to. 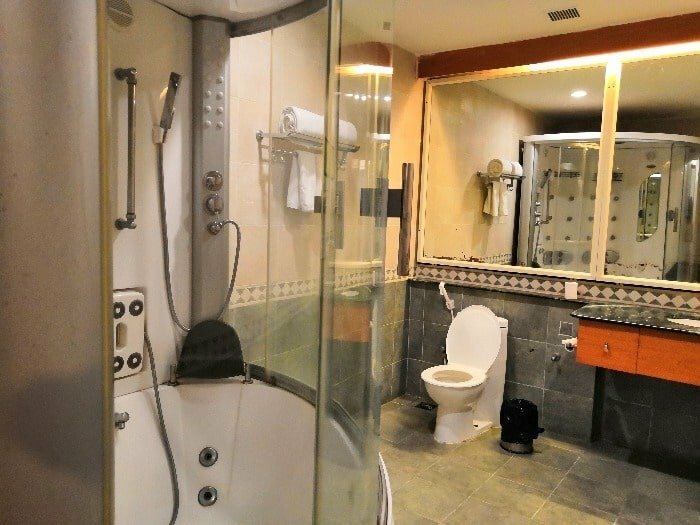 Apart from all the amenities, this category of rooms has a jacuzzi in the bathroom. There are two large mirrors, one at the dressing table and one right before you enter the bathroom. Check out some pictures of our Superior Lake Front Suite. The citrus cafe, which is the restaurant of this resort is very charming with large windows flaunting the lakeside views. The multicuisine restaurant has a very versatile menu to suit all tastes. I will recommend trying out the local cuisine at the restaurant. I cannot rate the food very highly because the garlic chicken we ordered at night turned out just sweet and sour. However, in our lunch, we had ordered Kerala chicken and that was quite delicious. The food is a little bit expensive, as expected from a four-star hotel. I loved the breakfast buffet at the restaurant. We had pre-booked the breakfast along with our stay as we normally do. A good mix of South Indian, North Indian and English breakfast spread, they left no room for complaint. This is what you can expect in the breakfast buffet- idly, vada, sambar, dosa on order, eggs on order, puri masala, paratha, fruit salad, fruit juice, milk, breakfast cereals, sausages, pancakes, marble cake. I am sure there will be variation, but this is the overall spread of the breakfast buffet. Upon request, we were handed a printed paper of all the various activities that we could do in and around the resort. There are Shikara tours organized by the resort, which is a must-have experience when you are in Alleppey. The boat tours are available from morning to 6 pm in the evening at an hourly rate of Rs. 1200. 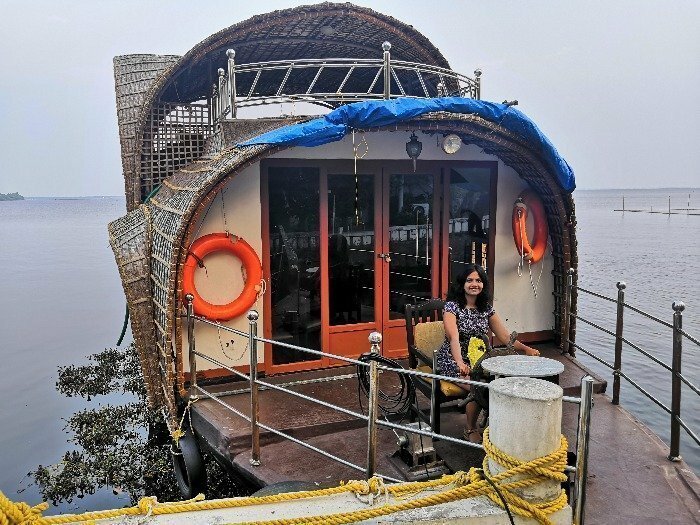 Read about our shikara tour in the backwaters of Kerala. The infinity pool is also a great place to relax and unwind inside the resort. The best part about this location is that, you can wake up to the most spectacular sunrise at the Vembanad lake. The sunrise timing is quite late in March here, at 6:30 am, but I woke up earlier to the chirping of birds and experienced the magic unfold. I must say that the activity center is not that great, but it does the work okay. There are some books stacked on the shelves (see picture), a carrom board and a pool table. In the evening you can walk in the gardens and spend time with nature. Another amazing facility offered by the resort is the provision of free bicycles to explore Alleppey. We had a car and spent less than 24 hours in a spectacular place, so did not have the chance to use this facility. There are many other facilities in the Lemon tree resort which I did not even check out. I can’t comment on how good they are because I did not enter the gym or the spa, but for the benefit of my readers, I am listing down all the facilities here. Vembanad Lake: The longest lake of India stretching 60 km finds its way through the villages of Alleppey as narrow canals and waterways. You will be living right at the banks of the lake so there is no way you can miss this. Patharimanal island: This idyllic island is located in the middle of the lake and can be seen from the lake-front rooms. Home to multiple migratory birds it is easily accessible by boats. Kumarakom Bird Sanctuary: On the other side of the Vembanad lake resort lies the Kumarakom bird sanctuary. 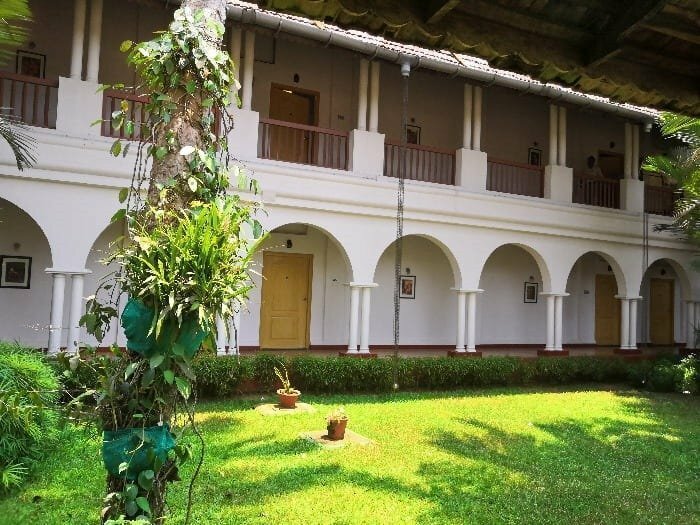 Like Alleppey, this is also a growing tourist destination with many homestays and houseboats. We these three places in our 3-hour long boat trip. You can anchor the boat to the shore and get down at the island or at Kumarakom for walking around. Marari Beach: A quaint beach 10 km away from the resort, Marari beach is notable for the big cross at the entrance and coconut groves around it. The chairs with colorful umbrellas lined on the beach add to the vibrant view. Alleppey Beach, lighthouse and sea-side park: The Alleppey beach is similar to the Marari beach but is smaller and a little more crowded. The Alleppey lighthouse museum is a place from where you can get a panoramic view of the town. Amazing religious architecture: The region has many pretty churches, some of them with extraordinary architecture. Arthunkal church and St Sebastian church are most famous for their architecture. There are some remarkable temples too around the resort, both in Alleppey and in the Kumarakom side. The Mullakkal Devi temple located 15 km away from the resort is a 500-year old temple open to people of all religions. The temple is famous for old Kerala architecture and the four-armed statue of Goddess Durga. 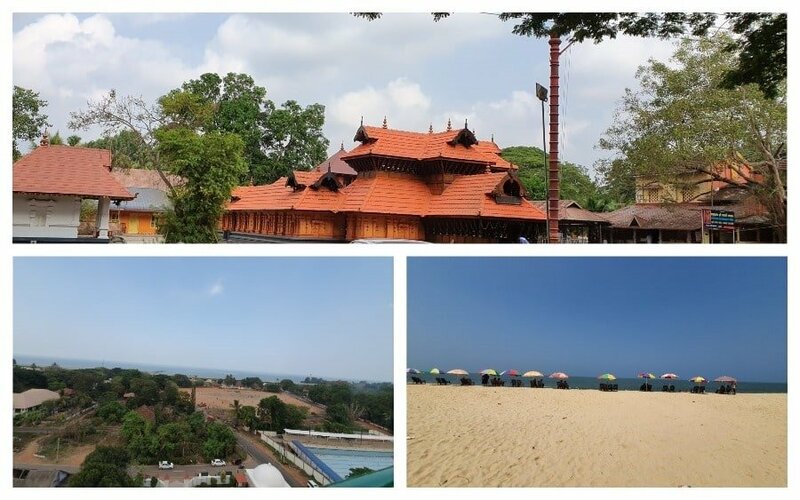 Another striking temple on the way to Marari beach is the Mararkulam Mahadeva temple. Value for money – 5/5 (because we were able to book at almost 50% discount and also got an upgrade). Use the following links to compare prices and book the resort. I love working on Backpack & Explore, but each post takes 5 hours or more to create. If you like our blog, please don’t forget to share, comment and follow us on social media. Subscribe to never miss an update from Backpack & Explore. Disclosure: The post contains affiliate links for accomodation. This means if you book through those links, I will get a small commission for referal, without any additional cost to you. More on it at the footer below. What a beautiful resort. I don’t think I would ever want to leave. The infinity pool at sunrise would be worth getting up so early for. It is a beautiful part of India – so serene and the backwaters are perfect for cruising. The Superior Lake Front Suite has got my name on it – I would love to stay there. So gorgeous! India has been on my list for so long and this is just another incentive to explore the south. Someday I hope to make it down there. What a great find at a great deal! I love it when an impromptu weekend getaway comes together like that. It sounds like a serene getaway where you get to enjoy the lake and all of nature. The infinity pool sounds like my spot! Unfortunately, I do find restaurants in hotels to be overpriced and underwhelming. It’s always great when you are doing a road trip, and find a great resort to rest along the way. 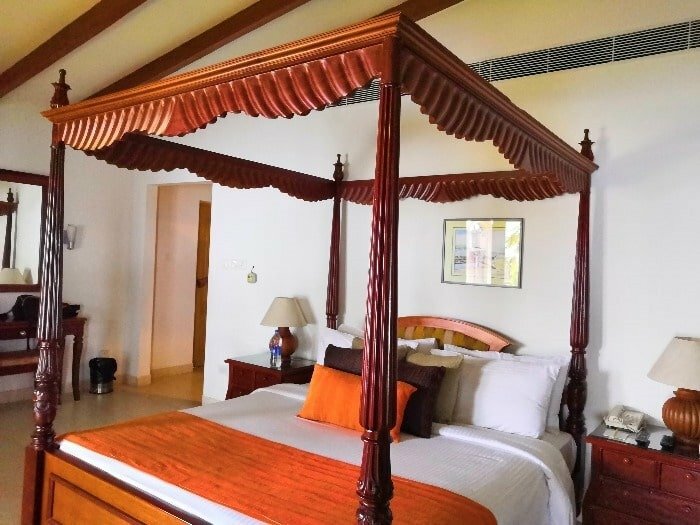 I can see why Lemon Tree Vembanad impressed you, especially when you were lucky enough to get the upgraded room! I also love the look of that Cruising Villa, does it also have a bathroom inside? Also appreciating the views from the resort, especially the restaurant and pool. Although you had to get down and knocked on the gate so they opened it doesn’t sound good, but… Your upgraded room looks so beautiful, especially the bathroom! 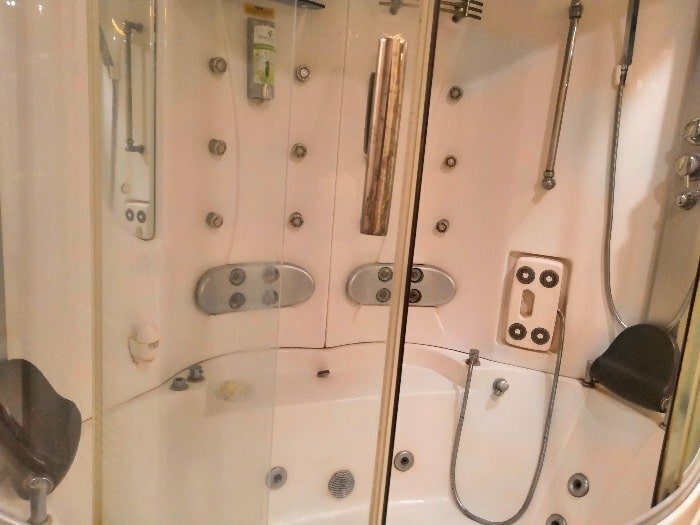 I’ll take that shower with water spraying all over my body. Jump in to the infinity pool with pretty sunrise view is also a must, in my opinion. No wonder you want to go back and stay for a longer time. The whole view, your hotel with gorgeous and comfortable bed, green lawn, plus a gorgeous sunset – all together makes this hotel is a destination. It feels like staying here makes you feel homey and pampered, and reconnecting to the nature. You gave us many reasons to consider this destination soon. This literally brought back lovely memories from my trip to Kerala and especially, Vembanad Lake. I had seen Lemon Tree hotel from my boat and did ask about it. Your post definitely show it from inside and it looks great. The sunrise view is lovely. 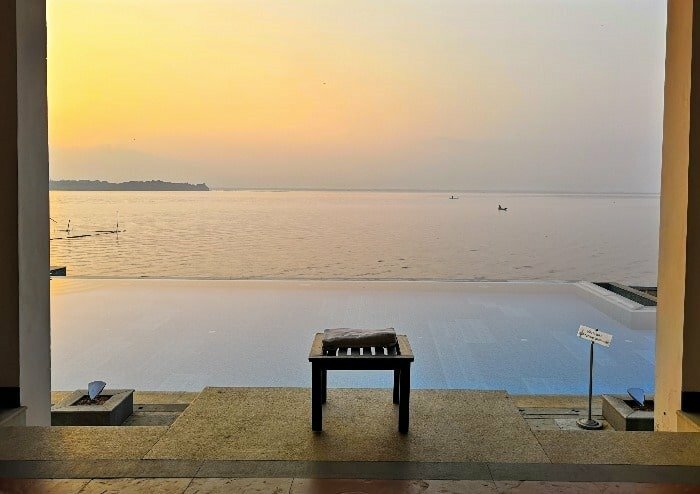 Infinity pool, free cycles to explore Alleppey sounds great. 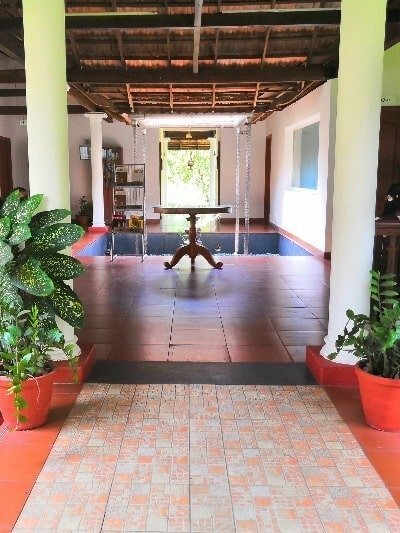 There is definitely lots to do around the Kerala backwaters and if you get a nice place to stay, nothing like it. 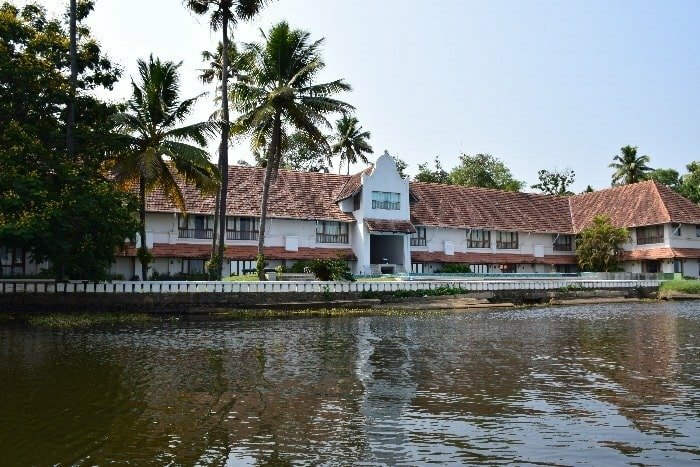 It is great that you found Lemon Tree Vembanad Lake Resort at last minute during your unplanned visit and that too in 50% or rate. Normally last minute bookings are expensive but it is great that you found your value for money and even upgraded your stay. Nice to see many activities near this resort like going to the Marari beach and witness the famous snake boat race of Kerala. It is great that you had a personal jacuzzi in your suite room. The wooden bed looks impressive. More than anything I loved the location of the Lemon Tree Vembanad Hotel. Its peaceful, serene and beautiful. The view from the breakfast table was really fantastic. I have been to Kumakom and loved my experience. Great knowing about this hotel and I would love to experience a stay there. Thanks Parnashree. It was an impressive location for sure.